2019 St. Patrick's Day Charity Event! Tickets will go on sale soon. Each ticket gets you in to the Friendly Sons of Saint Patrick Charity Event featuring food from 6pm to 8pm, live music, McGinley School Irish Dancers , live music by Funktion Band . Thank you to everyone who donated beer and wine to our event so we can offer free drinks at the bar! Tickets are available for purchase online from Eventbrite ( Click Here ) or directly from FSOSP members or at the door the night of the event. Sponsorships are available. 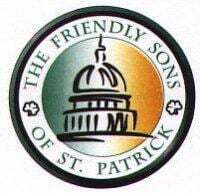 If you are interested, download and complete this PDF and mail with your check made out to "The Friendly Sons of St. Patrick" to: The Friendly Sons of St. Patrick, 908 N. 2nd Street, Harrisburg, PA 17102.